Add a touch of English hunting style to your home or garden using the Gardman Pheasant Wall Art. The bold colors, durable body, and generous size make this sculpture a striking addition to your decorating. The bird stands upright, seeming to support itself on its two orange legs, and its alert expression and raised crest enhance the look. The lengthy, extended tail furthers the realistic silhouette, and the reddish body, green neck, and white band offer color to any setting. Made from lasting metal, this item may be placed on an indoor or outdoor wall, and a keyhole opening on the back makes mounting quick and simple. The slightly curved body and wing bring dimension to your wall, while the array of hues adds excitement. 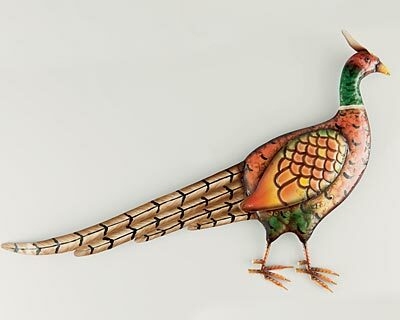 Celebrate wild birds in an artistic way with this Pheasant Wall Art. Note: Due to this product's handcrafted construction, each item may vary slightly in terms of finish and size.